Feeling overloaded and bloated from all the baked goods and sweets that have been making frequent appearances in my life ever since Thanksgiving, I felt the need for something light, refreshing, and healthy. 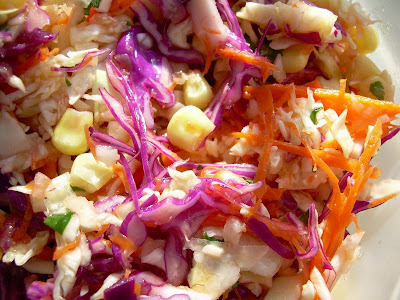 So, I pulled out my July 2007 issue of Bon Appetit, and decided to whip up a batch of Cabbage and Corn Slaw with Cilantro.One of the things that appealed to me about this recipe was its lack of mayonnaise. I wanted something that I could fill up on, and not have an iota of guilt over what I had just eaten. I had all of the ingredients on hand, except frozen orange juice, and coleslaw mix. So, I shredded up my own cabbage mix, and used Dole brand Pineapple-Orange-Banana frozen juice concentrate. Believe it or not, it tasted great! Whisk orange juice concentrate, lime juice, rice vinegar, and olive oil in small bowl. Season with salt and pepper. Dressing can be made 1 day ahead. Cover and refrigerate. Combine cabbage, corn kernels, carrots, red bell pepper strips, sliced green onions, and chopped cilantro in large bowl. Toss with enough dressing to coat. Season slaw to taste with salt and pepper. Let stand 15 minutes for flavors to blend. Toss again and serve. I am on a mission: to use up food items in my pantry and freezer. Like most people, I will buy this or that to use for a specific dish, then I forget all about it. Or I shop for produce, and loose a cucumber in the back of the refrigerator. Not one to waste food, I discovered said English cucumber tucked away in a corner of the “chill chest,” to coin a phrase from Alton Brown. 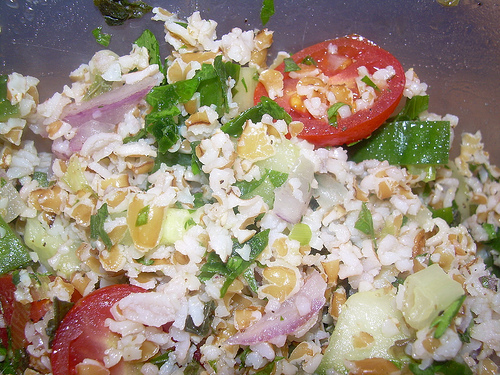 I also had some feta cheese to use up, as well as a bag of orzo that had been sitting around for a while. Oh, yes, and that red onion. And a lemon or two. What to do? 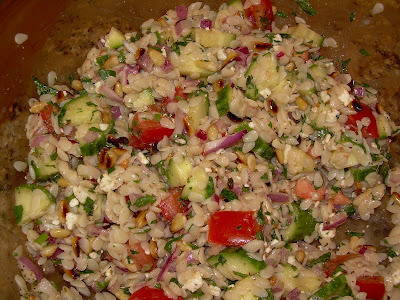 Well, I turned to Rachael Ray after seeing her whip up a Pine Nut Orzo salad on her show, 30 Minute Meals. Master Chow and I thought it was nice on its own when we had it at lunch, but it really shone when we paired it later that evening with a rib eye steak (for him) and some scallops and shrimp (for me). Since I have half a pound of orzo left in the cupboard, I’ll be making this again! Place a pot of water on the stove and bring to a boil for the pasta salad. When the water boils, salt it and cook the pasta to al dente. If your pasta bag doesn’t tell you how long that might be, start checking after 4 minutes. My orzo was al dente after 5 minutes. If you want to take some of the bite out of the diced onion, let it sit in the bottom of the salad bowl in the juice of the lemons while you cook the pasta and prep the rest of the ingredients. Drain orzo and add to the onions and lemon juice, along with the pine nuts, parsley, feta crumbles, about 1/4 cup extra-virgin olive oil, salt and pepper. Top with the olives, tomatoes, and cucumbers. One day, I found myself blessed with about 12 ears of fresh, farmer’s market corn. 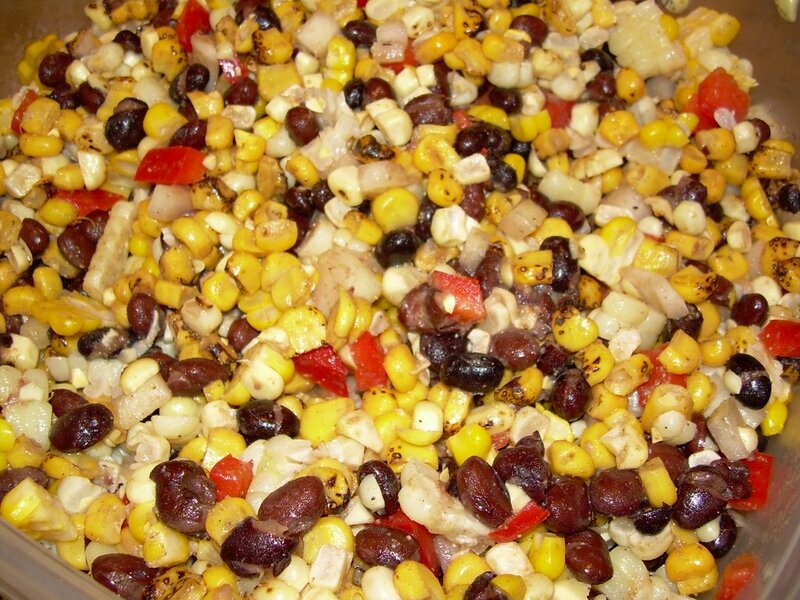 I wanted to try something different that would not heat up my kitchen (at the time, the temperature was hovering around 100 degrees), so I decided upon a black bean and corn salad. 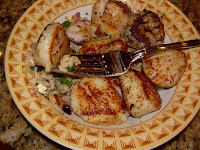 I adapted this from many different recipes that I looked at, including one by Rachael Ray of “30 Minute Meals” fame. All measurements are approximate – tweak the recipe to suit your tastes. You can use dried black beans that you cook yourself, but as I said above, my goal was to keep my kitchen as cool as possible, so I used canned. Whisk salt, pepper, Tabasco, and cumin into the lime juice. Stream in the olive oil, whisking all the time. Mix together the beans, corn, bell pepper, and onion. Add the lime juice dressing. Mix in the cilantro before serving. Gets better if you let it set a spell. This makes a lot of salad, plenty for 6-8 people. 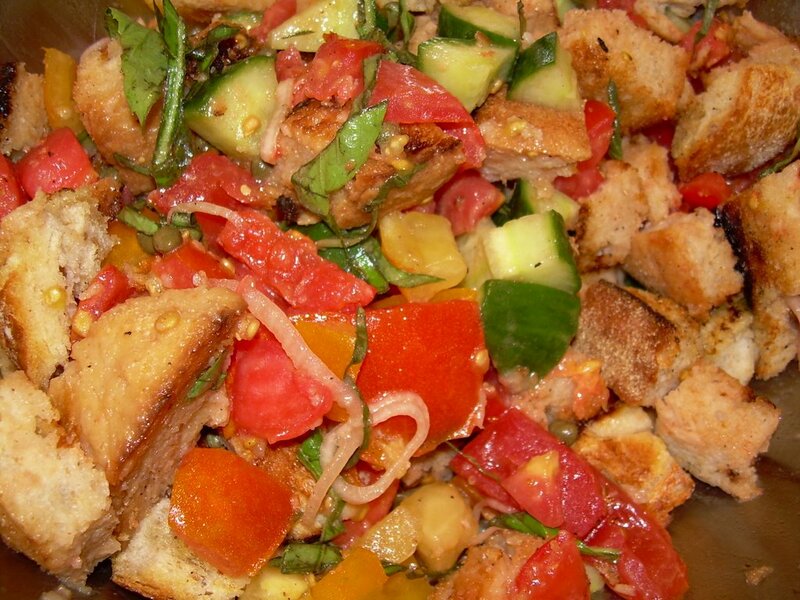 Panzanella is an Italian bread salad that makes wonderful use of the bounty of summer – fresh, ripe, juicy tomatoes. Fragrant basil. Crisp cucumbers. I always heard that it was a creative Italian way to use up stale bread. I’ve always loved panzanella, but was never really satisfied with different variations that I tried over the years. Until I picked up the September 2006 issue of Fine Cooking, one of my favorite cooking magazines. On the back cover I found a panzanella recipe that I decided to try, and have made about four times in the last month – it’s delicious. Below is my adaptation, where I omit only the three tablespoons of chopped fresh mint (there are enough flavors in this salad, and I believe it doesn’t need the mint). Other recommendations – use good artisanal bread, if you have access to it. This is not the time to cut corners; this salad benefits from good olive oil, vinegar, fleur de sel, and freshly ground pepper. 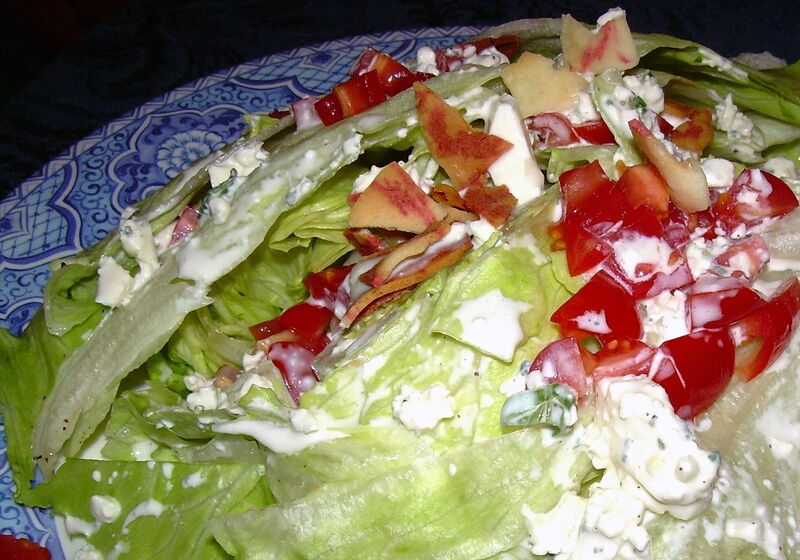 One final note – it’s best to add the bread to the salad just before serving so that it does not get soggy. You can mix the rest of the salad in advance (let it sit at room temperature – refrigeration affects the taste and texture of tomatoes), but add the bread at the last minute. Makes about 6 cups, and serves 4 to 6. Heat a grill pan (I just use a cast iron skillet). Using 1/4-cup of olive oil, brush both sides of the bread slices, and season with salt and pepper. Grill both sides of the bread, checking often, until lightly browned. When cool, slice the bread into 1/2-inch cubes and set aside. In a small bowl or measuring cup, soak the shallot rings in the vinegar for approximately ten minutes. Using a slotted spoon, move the shallots to a large mixing bowl, and reserve the vinegar. Sprinkle the chopped garlic with 1/4-teaspoon of salt. Using the side of a chef’s knife, mash the garlic into a paste. Add garlic, 1/4-teaspoon salt, and 1/8-teaspoon pepper to the reserved vinegar. Whisk in 1/4-cup of olive oil to the vinegar mixture. Gently toss the dressing, vegetables, basil, and bread together. Add more salt and pepper to taste, if needed. Note: Creampuffs in Venice offers her treasured family recipe for Panzanella, here.